If your physician confirms a diagnosis of skin cancer, she may recommend Mohs micrographic surgery. This procedure is most commonly used to treat Basal Cell and Squamous Cell Carcinomas. Mohs surgery is often suggested when it is critical to preserve as much healthy tissue as possible. Common areas for Mohs surgery include the face, ears, nose, and lips. 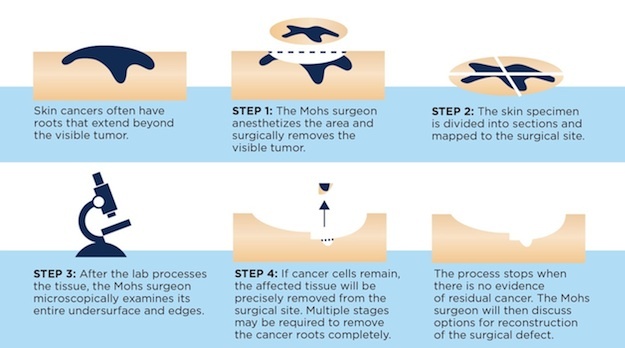 Mohs micrographic surgery is a highly specialized technique for skin cancer removal. The procedure was developed by Dr. Frederick Mohs in the late 1930s. It is now one of the leading techniques practiced by skin cancer specialists across the world, because of the cure rate it offers and its ability to maximize the amount of healthy skin preserved around the site of cancer. Mohs surgery is often performed under a local anesthetic in a physician's office. 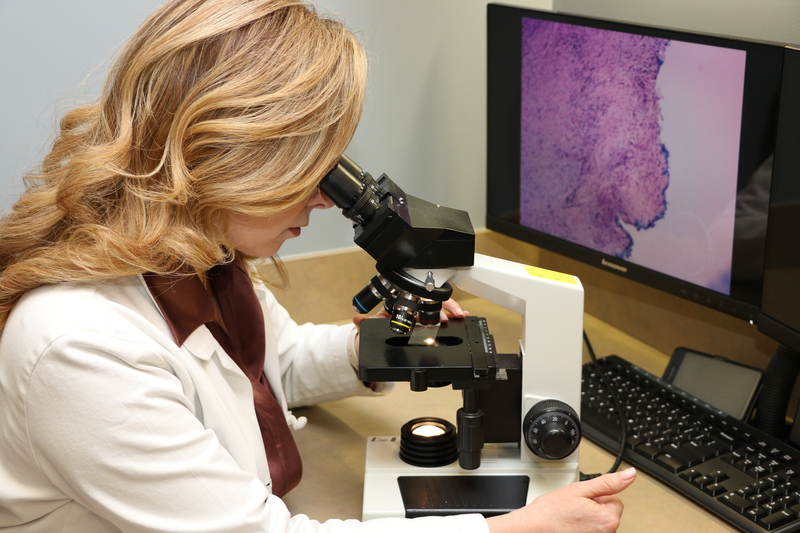 During Mohs surgery, skin cancer is shaved off one level (layer) at a time and immediately examined under a microscope. This process is repeated until all skin cancer cells have been removed. During the time between levels of skin being removed and examined, the patient waits with a temporary bandage covering the defect (open wound). When the patient is cleared of skin cancer, the defect can be closed. In settings where Mohs surgery is not available, skin cancer is removed and sent off to a lab for evaluation. A patient may wait days before learning that they will need to return for additional tissue to be removed and tested. With Mohs surgery, patients can be cured the day of their initial office appointment. After skin cancer is cleared with Mohs surgery a patient will have what is referred to as a defect. This is a hole or open wound where the skin cancer once existed. Your surgeon may decide to close the defect, depending on the size and location. Your surgeon may also wish to refer you to a plastic surgeon for a more cosmetically advanced approach to closing the wound. This is particularly common in areas such as the face, ears, lips, nose, and eyelids. At SCARS Center, our patient care model involves Mohs dermatologists and cosmetic surgeons working together to provide skin cancer cure with the best cosmetic outcome possible. Additionally, SCARS Center is equipped with an outpatient surgery center. This allows our team of physicians the opportunity to provide complete skin cancer care in one, convenient location. Contact us today. SCARS Center specialists will create a customized treatment plan that works best for you.